Beautifully redesigned by Botticelli and Pohl Architects and renovated by O’Connor Custom Builders. Nantucket Real Estate. Better than new - custom built magnificent lakefront estate with stately front and rear elevation and expansive water views from virtually every room! Florida Real Estate. This magnificent, custom designed home sits on the shores of Manzanita Bay with hundreds of feet of no-bank waterfront and a deep water dock. Bainbridge Island Real Estate. Residing on the shores of Lake Michigan, this custom built coastal retreat is exceptionally true to its lakefront character with lake lifestyle radiating throughout. Michigan Real Estate. 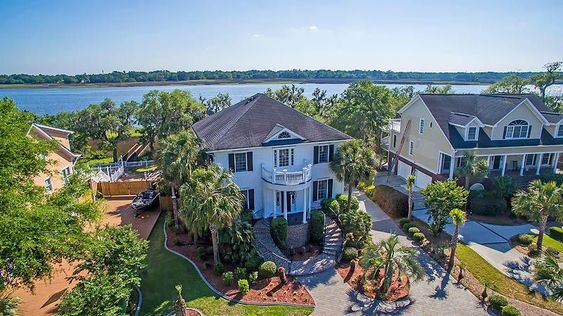 If looking for a stunning deep water home, on the Ashley River, that is both beautifully designed and located in a postcard-worthy setting, look no further. South Carolina Real Estate.